There is a typhoon coming. We have to go to Tokyo for a meeting with the Cabinet Office on Monday. We fly on Saturday as word has it that all flights will be cancelled on Sunday. First mistake, instead of taking the limo and going through the VIP no hassle path with colleagues, I, for a variety of reasons, take my own car. I get to the airport in plenty of time and look at the screen. My flight leaves at 16.45 and there it is – gate 35. Things start to get odd at security. Naha is usually a quiet little airport full of orchids and happy people. Today there are long lines of very stressed looking tourists. I realize that everyone is trying to get off the island before the typhoon arrives. I finally get to the front of the line put my ticket on the scanner thing and it goes red and strange kanji appear. I am at the wrong gate. 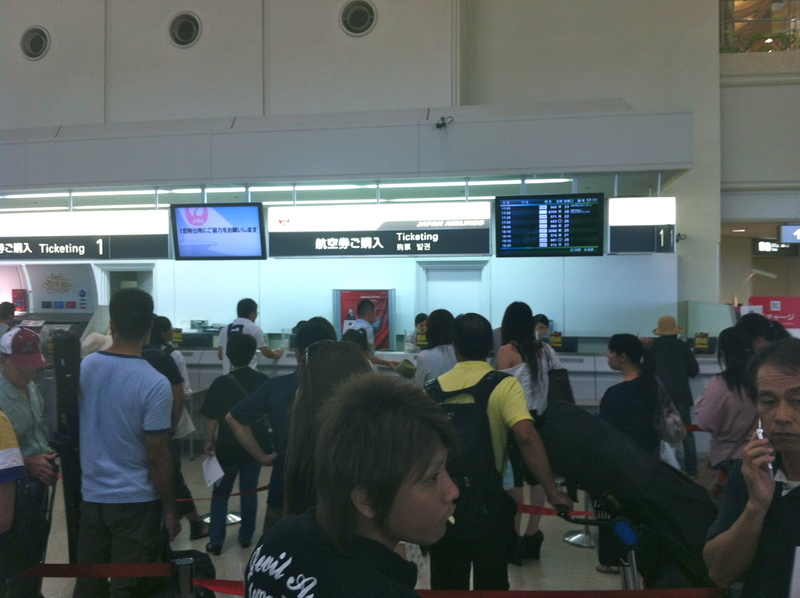 There are two flights to Tokyo leaving at 16:45, one JAL, one ANA. I am on the JAL flight but trying to get through the ANA gate. I rush to the the correct gate, of course at the other extremity of the airport. Long lines and also by this time a general feeling of sickness have overcome me. I have been fit as a dog for 2 years but suddenly my stomach is queasy and I have a fever. I get to the gate but too late – I have missed the flight. I go to the JAL ticket desk to find a mass of people trying to change tickets. Oh well I will just wait and listen to current book on the IPhone. A little piece of cardboard has got into the earphone jack and I cannot get it out. I wait for 90 minutes feeling awful, sweating horribly and finally manage to get a seat on the 10:35 flight next day going to the wrong airport in Tokyo. 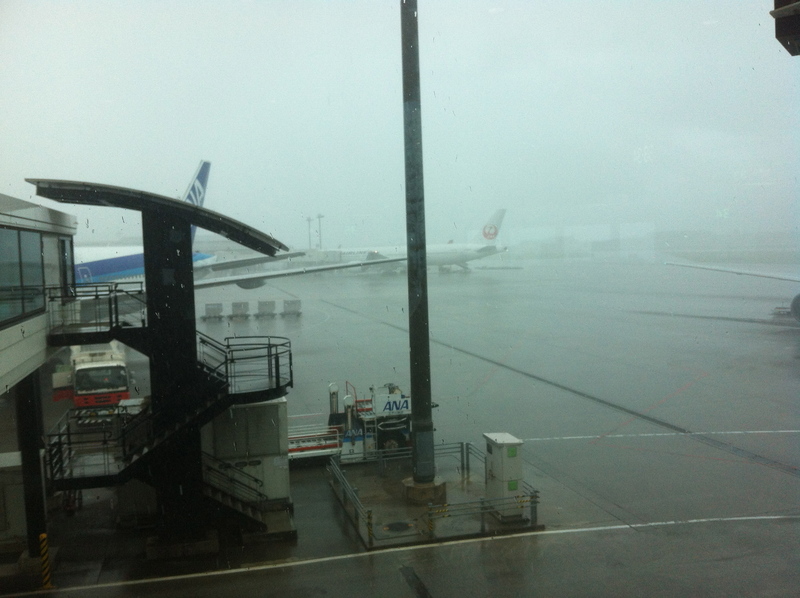 It is the last ticket and there is no guarantee that the flight will leave due to the typhoon. There is a real feeling of apocalypse as families desperately try to get home. The screens display lines of cancelled flights. I feel quite proud of myself as with luck I should get out. I head for home. The phone rings and it is my amazing assistant saying don’t move as she may be able to get me onto a flight leaving that night. I pull over and sit in an isakaya and eat a fish with zero appetite. I feel dreadful. Sure enough I should have left everything to people more competent than I as a better flight has been found, still the next day, but earlier thus with a better chance of leaving. Notice this is now 6:30 on a Saturday evening. Thanks Naoko, thanks Yoko for your kindness. I head home again. It is dark ,windy and raining heavily. I take the wrong entrance onto the only motorway and thus spend a waste 30 mins trying to get back onto the North lane. I feel very low by the time I get back to the flat some 6 hours after I initially set off. The wind is howling and I spend a restless night before getting up at 5:30 to head to the airport again. 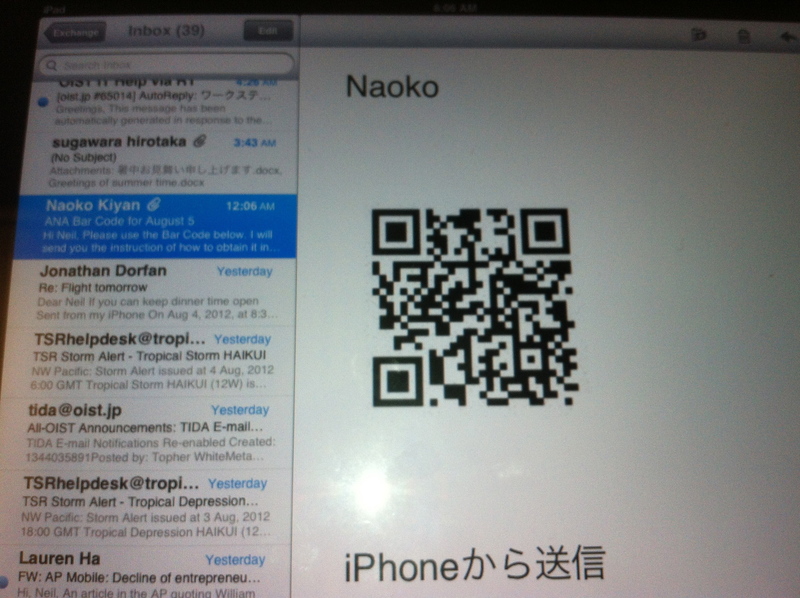 Naoko has sent my new reservation by email. I open a link which brings up a bar code thing on my phone. I just put the phone on the scanner and that is all there is! No ticket, no check in, no boarding pass just an iPhone. I am writing this on the plane just before take off. Strong wind outside!